“I don’t have time today. I’ll do it tomorrow.” Sound familiar? Not enough time to work out is one of the top reasons people give for not getting started or falling off the wagon. Life just got in the way. And I get it. Until recently, I had a full time + job and a personal business. I started my morning with clients, worked a full day in the office, sometimes brought work home, and ended my day with clients in the evening. Then I had a home with dogs and a cat and a personal life. My work out was seriously suffering and so was I. Believe me I get it! Getting into the groove of a fitness routine can be tough. Life is busy. If you have a spouse or significant other, multiply busy by two. Add in schedules for kids, busy just does not begin to even cover it, right? The fact of the matter is, if you do not take care of yourself first how can you be in the mental and physical space to take care of anyone else? You can’t. Signing up for an event with a buddy is a great start. Then put your training schedule on the calendar and stick to it. Let’s face it, if it’s not scheduled it’s not a real priority or actually a real anything. I’m not saying sign up for a marathon or even a 10k. Maybe it is the 108 Sun Salutation challenge or a 5k benefiting a local charitable organization. The important thing here is to choose an event that is reasonably conveniently located and just outside of your workout comfort zone. If a 1 miler is easily accomplished with the dog every day then ramp it up to a 5k. If a 5k is something you could go out and manage without a bit of training, make it a 10k. Whatever the choice make sure it is one that will require an increased commitment to your workout in order to finish and feel good about the effort. If you need a bit more accountability join a team or do it with a friend. Scheduling an event with accountability to another person makes it a lot harder to say “I’ll do it tomorrow”. If your buddy is going to be waiting for you at the trail in 30 minutes, You’ll probably make an extra effort to get there. Remember, “What may be done at any time will be done at no time.” Scottish proverb. 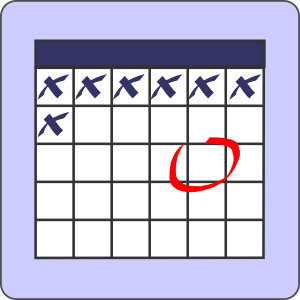 Once your event and training schedule is on the calendar you need to follow through and get moving toward that new goal! Check back in next week, when I talk more about my motivation tricks for getting started!